M.M. 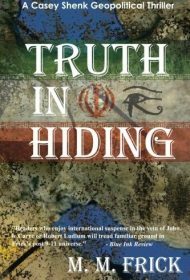 Frick’s geopolitical suspense thriller Truth in Hiding is the third in a series featuring Casey Shenk, a vending machine stocker turned political analyst, who is trying to expose the Council, a shadowy group whose members use their government and military positions in government to manipulate world affairs. In this story, Detective Paul Giordano asks Shenk to contact Iranian lecturer Davood Raad, an informant he believes might know who is involved in the suspicious death of a prison inmate previously involved in a Council-ordered killing. Although Shenk’s boss at the political think tank where he works has ordered him not to pursue his obsession with the Council, he digs in. Shenk is then accosted by an Israeli assassin, who reveals that Raad is an Iranian spy who has been divulging information from a government source possibly within the Council. Drawn into the hunt for the leak, Shenk quickly becomes an assassination target himself. Frick skillfully uses dialogue to impart information and moves the story along at a fast pace. But the novel presents some obstacles for readers. The narrative depends heavily on familiarity with previous books, and the author introduces characters and situations so rapidly, and in such numbers, that it can be difficult to follow. Although Shenk is a political analyst, trained to look at situations from all angles, he oddly often fails to foresee the consequences of his actions. And while Frick’s action scenes are compelling, the interrogation and torture scenes are more stereotypical than suspenseful (good cop/bad cop; the implication that this could happen to you, too, if you don’t talk, etc.). Frick’s story offers many twists and turns, and his presentation of the complex relationship between the US, Israel and Iran is intriguing, but it comes too late in the book to give a firm context for the plot. Ultimately, readers will find the makings of a heart-pounding thriller here, but the story requires revision to reach its full potential.